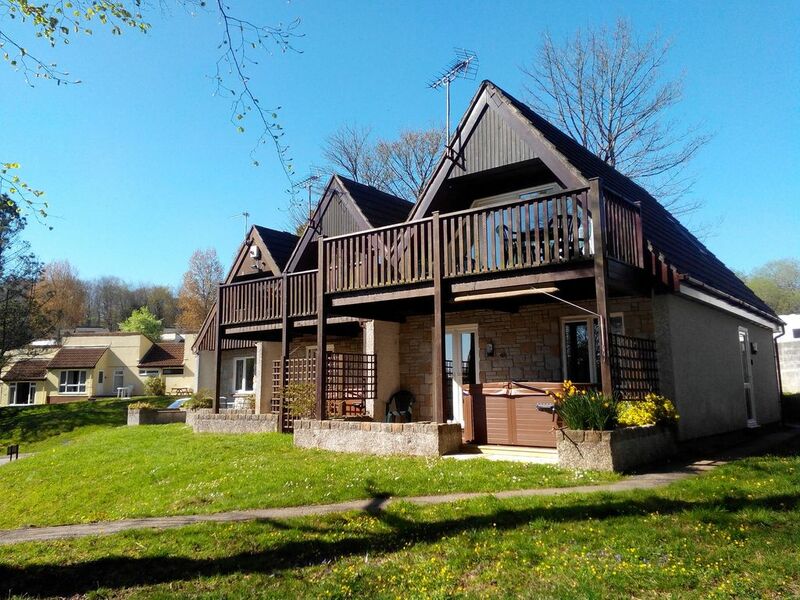 Our privately owned self-catering lodge is set in the beautiful, tranquil wooded Tamar Valley on the Cornwall/Devon border. The Valley is designated an Area of Outstanding Natural Beauty (AONB) and a World Heritage site. The lodge is set in a wooded holiday park on the side of a valley with streams and landscaped woodland surrounding the lodges. Even in peak holiday periods the atmosphere is peaceful, particularly as our lodge is set on the edge of the park. All the comforts of home are available in our lodge and the timber sundeck is ideal for outdoor eating or just relaxing with a drink and watching the spectacular sunsets, or enjoy the private Hot Tub on the patio. The on-site Leisure Facilities are inclusive in the cost of the holiday. There are two heated swimming pools, one indoor, one outdoor (summer season), a small gym and tennis courts. Suitable for group accommodation, the adjacent lodge is also available from the same owner. For family get-togethers, walking or cycling groups the lodges are ideal. Plymouth, Tavistock, Launceston, Liskeard and Eden Project are all within easy reach. Ground floor - Bathroom with electric shower over bath can be used as en-suite or family bathroom. Separate shower room with mains shower, basin & toilet. First floor - spacious lounge/dining area with seating for up to 6, TV, DVD player and radio. Archway to kitchen. Glazed door to large timber, south-facing sundeck. Fully fitted kitchen on first floor with cooker, fridge, freezer, washing machine, tumble drier, microwave, toaster, kettle and all necessary cooking implements. Large decked balcony suitable for outdoor eating. Tennis court on site. Raquets can be hired. World renowned St. Mellion Golf course is approx. 8 miles. Trethorne is in easy reach. Notes on accommodation: One or two well-behaved dogs are acceptable. The charge for this is £25.00. Use of Hot Tub is included in the price Outside: There is a spacious, private sun-deck with outdoor dining furniture and a decked patio on the ground floor with access from Bedroom 1 with built in stone seating and a private hot tub. Cleaning / Towels / Linen / Maid service: Bed linen and towels are provided. The lodge is cleaned and the beds made up prior to your visit. Additional cleaning during your stay is available on request at an additional charge. The lodge will be cleaned after you have left. The lodge is a home from home. The hot tub is lovely in beautiful surroundings. Was disappointed it wasn't a double bed though. Glad you enjoyed your stay. The beds are zip link singles to double. I am sorry they weren't in the right format for you. At least you had good weather! The nearest beaches in Cornwall are at Whitsand Bay on the south coast (approx 30 mins. drive) The whole of the Cornish and south Devon coast line is within easy reach by car. Please go to our own website (see link below) for further information on the local area and attractions.